Alcoholic neuropathy is a disorder that affects up to 65% of people who have been drinking alcohol for long periods of time. Although it can also affect people who drink heavily for shorter periods, it is more common among those who have a long history (more than ten years) of alcohol consumption. 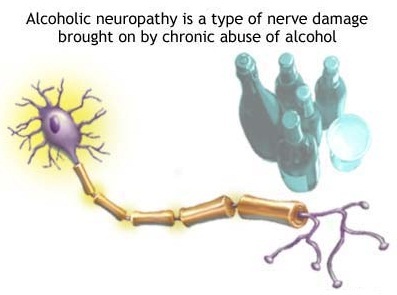 What Are the Symptoms of Alcoholic Neuropathy? Call your doctor if you experience any of these symptoms for proper diagnosis and treatment. It is not clear what causesalcoholic neuropathy, but experts believe that alcohol may exert direct toxic effects on the peripheral nerves. It can also indirectly affect them through poor nutrition, which is often associated with chronic alcoholism. Severe cases may also manifest as abnormal regulation of internal functions, which are controlled by the autonomic nerves. Your risk of developing alcoholic neuropathy increases with chronic heavy alcohol consumption or alcohol use for at least ten years. Depending on the degree of nerve involvement, some treatments can help reduce your symptoms and prevent permanent complications from happening. Many chronic alcoholicstend to have poor diets. To treat vitamin deficiencies associated with chronic alcoholism, doctors may recommend taking medications and vitamin supplements such as folic acid, biotin, vitamin A, B-vitamins (thiamine, niacin, pantothenic acid, pyridoxine, cobalamin) and vitamin E. These must be taken in addition to a healthy, balanced diet. Nerve pain is a common problem in patients who have alcoholic neuropathy. To relieve chronic nerve pain associated with alcoholic neuropathy, your doctor may prescribe pain relievers and anti-seizure medications such as Gabapentin (Neurontin), Carbamazepine (Tegretol), Pregabalin (Lyrica), Phenytoin (Dilantin), and Topiramate (Topamax). If these are not enough to control severe pain, opiates may be prescribed. However, these drugs can cause physical dependence and addiction. Other options to control nerve pain include the use of antidepressants like amitriptyline (Elavil), duloxetine (Cymbalta), and nortriptyline (Pamelor). Muscle weakness, lack of sensation and impaired coordination can make it difficult for you to do daily activities. To improve muscle function, your doctor may recommend some therapies, such as physical and occupational therapy. Training to perform of activities of daily living, such as eating, bathing and going to the toilet. Some may also need training in using adaptive equipment. Training to perform compensatory strategies when your limbs are weakened or lack of sensation. Dizziness and lightheadedness may occur when you are standing up. The condition may need several kinds of treatments before determining which one can successfully reduce the symptoms, which may include wearing compression stockings, increasing intake of salt and sleeping with your head elevated. Using medications can also treat the condition. Bladder problems are treated with intermittent catheterization as well as manual expression of urine. Medications can also be prescribed to treat any bladder problems. People with alcoholic neuropathy should protect body parts with reduced sensation from any kind of injury. To protect the body, you have to check the temperature of water before bathing to avoid burns. Changing footwear and inspecting the shoes to lessen the risk of injury from pressure is also recommended. Likewise, guard the extremities to avoid injury from pressure. Several medical conditions like diarrhea, constipation and impotence are treated when needed. These symptoms do not respond very well to treatment in patients suffering from alcoholic neuropathy though. Are There Any Complications of Alcoholic Neuropathy? If you have these symptoms and have been consuming alcohol for long periods or drinking heavily, it is important for you to seek immediate medical help before these complications occur.